How can a ladybug who’s just a little different fit in? Lucy is shunned by all the other ladybugs. “You can’t be one of us,” they cry. “You have no spots.” It’s true; Lucy’s orange wings are unspotted. She flies away, feeling sad and alone. Lucy encounters Fred Frog and envies his bright green spots. He generously shares one with her while reminding her that she’s beautiful. “You float so smoothly through the air!” Buoyed a bit, Lucy floats on, next meeting Carla Caterpillar, who rides a big tandem bicycle and has bright yellow spots. Lucy admires these, and Carla, like Fred, generously gives her one. Next comes Felicity Fish (who seems to function just fine out of the water), who gives Lucy a bright blue spot. And Bella Bird gives Lucy one of her dazzling white spots. With four beautiful new spots, Lucy at last feels like a real ladybug. But when she returns home, she realizes that all of the other ladybugs have black spots. She’s not like them at all. And the very next moment, Lucy decides that being different “was actually… / a good thing!” This epiphany is underscored by a big, bold, four-page fold-out surprise. 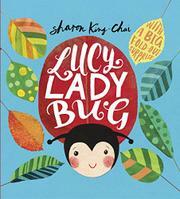 Both King-Chai’s text and illustrations, seamlessly adapted from the app Lucy Ladybird (2014), are bright and uber-cute, easily carrying the valuable message.